Hunger, malnutrition and death threaten 6.5 million children in the impoverished drylands of Somalia, Ethiopia and Kenya due to back-to-back droughts, a charity has stated, with spring rains also predicted to be poor. Repeated rain failures have pushed 15 million people across the three countries into crisis, and in need of aid, as their animals are dying and water is in short supply, Save the Children said in a statement. “The situation for already desperate children and families in Somalia, Ethiopia and Kenya will only get worse – leaving millions at risk of hunger, and even death,” the charity’s Ethiopia country director, John Graham, said. The next rainy season is likely to bring more below-average rainfall across the region, experts predict. Almost 500,000 children already have severe acute malnutrition, Save the Children said, which means they risk dying without emergency intervention. Donors, political leaders and the new United Nations Secretary António Guterres are meeting at the African Union (AU) summit which opened on Monday in Ethiopia. Guterres was the U.N.’s refugee chief during Somalia’s 2011 famine, in which 260,000 died due to drought, conflict and a ban on food aid in territory held by the Islamist militant group, al Shabaab. The U.N. warned this month that Somalia, crippled by decades of war, risks slipping back into famine as five million people, or more than four out of 10 residents, do not have enough food. Fighting between al Shabaab and Somalia’s AU-backed government continues, with 28 killed on Wednesday in an attack in the capital, Mogadishu. AU and Somali troops have driven al Shabaab from major urban strongholds and ports, but they have often struggled to defend smaller, more remote areas from attacks. Thousands of Somalis are on the move in search of food and water, many crossing into Ethiopia for assistance, charities say. Save the Children said there are high rates of malnutrition among children it has screened on arrival in Ethiopia’s vast Dollo Ado camp. 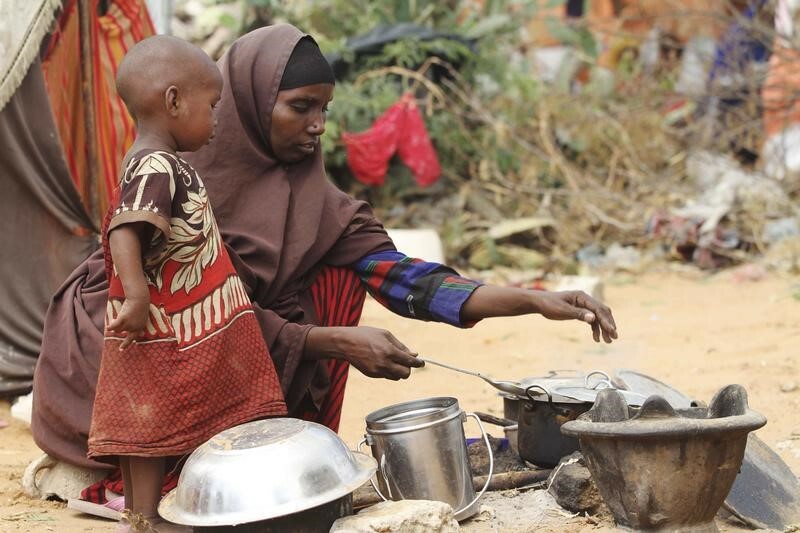 Many Somalis have been living in exile for three decades, with almost one million in refugee camps in nearby Ethiopia, Kenya, Djibouti and Uganda, where food is also in short supply due to lack of funding. In Ethiopia, hard hit by drought in 2016, almost six million people need aid and more than one million are going hungry in Kenya, with numbers predicted to rise in the coming months.